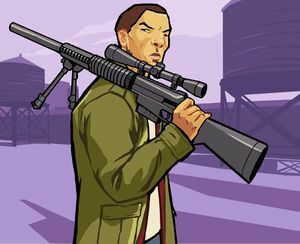 Huang Lee is the 26-year-old Chinese protagonist and playable character of Grand Theft Auto: Chinatown Wars. A spoiled rich kid from Hong Kong, Huang owes his status as a Triad member to his father, a Triad boss from Kowloon. Huang was in Liberty City during 2002 for unspecified reasons, and was arrested for trademark counterfeiting. Three years later in 2005 Huang was in Liberty City again, however this time, he was arrested for grand theft auto. After the murder of his father, his uncle, Wu Lee asked Huang to deliver a family heirloom, the Yu Jian Sword, to secure his family’s claim to the leadership of the Triad gangs. In 2009 he calls Huang to Liberty City. However, what was supposed to be a weekend of table service and strippers turns into a dangerous adventure after arriving at Francis International Airport only to be hijacked, robbed of his sword, and left for dead. Huang dug deep into the rotten core of Liberty City - and deep within himself -- to avenge his father's murder and reclaim his family's honor. Throughout the course of the game, Huang is been shown to be very cocky and quick-witted. He appears to be much more intelligent than other characters who seem to be oblivious to Huang's constant mocking and sarcastic remarks in the game. Huang does not value honor and tradition in the same vein as his Uncle, claiming that "this is 2009 not 1403." However, he is very loyal to his family and his gang, following their orders with little hesitation, even to the point he'd murder other Triads. Huang acknowledges the fact that he is a "pampered little snot" in the opening cutscene, and he reveals that he has visited Liberty City before where he "caught crabs from a Swiss tourist." He seems to dislike the characters he gets missions from but he does show the occasional respect for his Uncle Wu Lee. Huang has a record on the LCPD Database in Grand Theft Auto IV. It states that he is a 25 year-old Chinese native and known associate of Wu "Kenny" Lee's Liberty City Triad Gang. His record also states that he is been believed to be working freelance for other organizations in addition to his uncle's. The bombing of a store protected by the Spanish Lords. Accompanying the murder of a patient under police protection. The robbery of The Bank of Liberty. Assassination of an informant who sold out Chan. Searching for Zhou Ming's contraband scattered all over the river. The bombing of the Monoglobe. Huang holding a sniper rifle. The correct pronunciation for the name Huang is whawng. People mistakenly pronounce the name as whang, which is incorrect. Huang commonly translates to yellow but can be translated to anything that uses the same pronunciation. Another area of confusion is the mixed use of Mandarin and Cantonese spellings in his name. Huang Lee hails from Hong Kong, where the Cantonese dialect is more commonly used, but "Huang" is written in a Romanized Mandarin spelling when "Wong" or "Wang" should be used; "Lee" is correctly Cantonese, while the Mandarin equivalent is "Li". This means Huang Lee's name may also been purely referred to as "Wong Lee" or "Wang Lee" in Cantonese and "Huang Li" in Mandarin. His early background in Hong Kong remains largely unexplained. Affiliations: Known Associate of Wu "Kenny" Lee's Liberty City Triad Gang. Nephew of Liberty City Triad Boss, Wu "Kenny" Lee. Believed to be working freelance for other organizations in addition to his uncle's. In The Ballad of Gay Tony, two of Lee's safehouses are drop off points for Armando and Henrique's drug empire in the Drug Wars side mission. Surprisingly, Huang does not show any remorse for killing Chan and Zhou after finding out that they weren't informants. He generally showed signs of resentment towards them both, presumably explaining his lack of concern over their deaths. You are not able to change the clothes Huang is wearing. 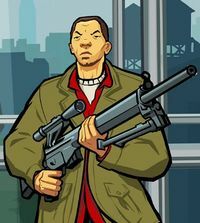 Huang Lee is only GTA protagonist who comes from Asia. Huang seems not to mind killing other Triads in many missions. Because of what Hsin Jaoming said at the end of Salt In The Wound, it is suggested that Huang became the leader of the Algonquin Triads. Huang's appearance alters slightly between platforms. In the original DS version, he appears to have black, or dark brown hair and fairly pale skin compared to the later versions. In the PSP version, Huang has brown hair during gameplay and in cutscenes. In the iPhone/iPod Touch version, Huang has black or dark brown hair during gameplay and brown hair during cutscenes. This page was last modified on 12 May 2014, at 18:33.